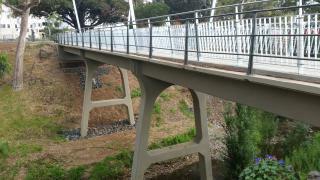 Heritage listed, 2nd oldest reinforced concrete girder bridge in South Australia was repaired and restored with RADCON Formula #7®. The Sir William Goodman Bridge, located between Holland Street in Thebarton and Manton Street in Hindmarsh, was consructed back in 1908 as the only tram bridge in Adelaide. Repaired and restored to its orignal condition, RADCON lifetime waterproofing was applied to the concrete bridge deck of this historic structure.